Ken was first licensed in 1975 in Colorado Springs, but he got his start in our great hobby, about ten years prior while stationed in Oregon. Ken was living in Oregon at the time, with his wife Evelyn, when a fellow Air Force buddy, none other than Jack, WM0G stopped by and asked Ken to keep an eye on his ham radio equipment while Jack was traveling. Ken agreed to babysit Jack’s equipment, and the rest is history !! Jack knew of course, by leaving the radio, along with a long wire for some serious Short Wave Listening, that Ken would be smitten by the Ham Radio Bug !! Sure enough, it worked and by doing that “favor” for Jack, Ken became interested in Ham Radio obtaining his Novice license in 1975 while stationed in Colorado. 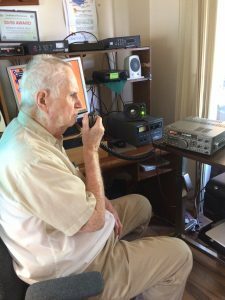 That first encounter with Ham Radio was in 1961, but years later (1992 to be exact) Ken had checked into the GERATOL Net, and a gentleman from Colorado gave him a call and asked if Ken had ever served in the Air Force, and if he had ever been to Klamath Falls. Indeed the answer was YES to both questions, and the inquiring Ham was none other than his old Air Force buddy, Jack, WM0G ! Imagine, after all that time since Jack had sparked Ken’s interest in radio, thirty years later they were having a QSO on the GERATOL Net !! This is truly an amazing hobby, and this is a great story about two old Air Force buddies reconnecting via the GERATOL Net. After Oregon, Ken had moved on to Colorado, where he studied for and then received his ticket. His fellow Club members served as his Elmer, teaching him the basics and helping Ken achieve his Novice ticket, where he was licensed as WN0TLR. His rig at the time, was a staple for many of us beginners, a HW-101 which he fed into a dipole antenna up a whopping twenty feet in the air !! But it worked !! Years later, Ken and his wife Evelyn settled down in “Little Rhody” aka: Rhode Island in 1988 after traveling and serving in the Army, Air Force and then Bendix Engineering. Ken is one of a handful of ops on the GERATOL net, who served in more than one branch of service. His dual service helps those working toward the Veteran’s Salute Award. Over the years, Ken’s eyesight had deteriorated and in 1990 the Handi-Hams group (a great organization) lent a hand by sending Ken a Century 21 CW rig, modified for visually impaired hams. Ken pounded away at CW, getting to 20 wpm proficiency and obtaining his Extra Class ticket ! Ken then upgraded his gear to a Kenwood TS440S, coupled with a G5RV antenna. He got hooked on County Hunting during the day time hours on 20 Meters, and has completed ALL counties, now five times over !! As Ken stated in his bio material he sent me, “What an adventure” What an accomplishment Ken ! Well done. In addition to his County Hunting prowess, Ken has amassed over 137 Countries for his DXCC. One of his more memorable DX contacts was working both the North Pole and Alaska during Christmas time. Ken served in the Army from 1948 through 1952, and then in the Air Force from 1955 through 1975. Some of spots he visited while serving included: Republic of Panama, Puerto Rico, Alaska, Iceland, Korea, Vietnam and even Thailand. Ken has not only Worked All States on the GERATOL Net, but he has also visited all 50 states in person, while with Bendix Engineering. His wife Evelyn of 49 years passed away in 2006. She hailed from Denver, Colorado and was a great support for Ken while he was studying toward his ham license upgrade. She would test and quiz Ken so often, he says that it got to the point where she knew more than he did !! She provided that same support to Ken in his pursuit of Economics, where he eventually graduated with a degree from Roger Williams College. As we all know, Ken hails from the little state of Rhode Island, which also happens typically to be a “tough one” for many ops to get on 80 Meters, but Ken is there most evenings, putting RI in the log books of so many future GERATOLers, as well as bringing his excellent operating skills and gentlemanly manner to the net. By the way, for those who may not know it, Ken recently achieved obtaining GERATOL # 2669 for his Club Call: AA1KM ! Congrats on that latest achievement Ken and thanks for all you do for our net. Ken, Nice bio and history. Can’t thank you enough for keeping Rhode Island alive and well on the NET. Have shared many years with you on the Net and it is just great to see all of your history. Great job as usual. Ken, ditto comments as Dave KJ8V made. So great to have Rhode Island on the net, and so very well represented. Thanks for taking the time to share your Ham Radio story with the rest of the net, I especially got a kick out of the past history you have with Jack.